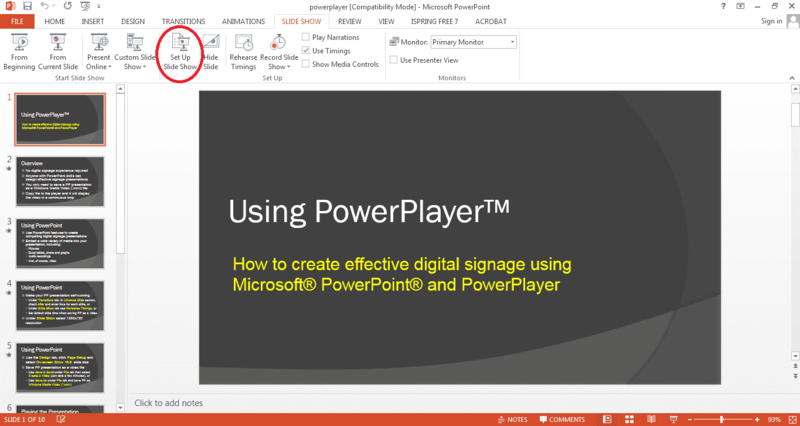 This article outlines how to convert PowerPoint to digital signage. Microsoft® PowerPoint® is the perfect digital signage content creation tool. You can create signage presentations using PowerPoint’s layout management, text, pictures, page transitions and animation effects. Add cutting-edge high definition video to capture your customer’s attention and drive home your marketing message. And because you’re not (likely) a great graphic artist :( use widely available PowerPoint templates to create professional-looking signage presentations. To convert PowerPoint to digital signage you must make your presentation self-running—ensuring each page is displayed for a specified time—and to configure it to run in a continuous loop. Normally a PowerPoint presentation only advances, slide-to-slide, when a presenter clicks their mouse or presses the keyboard. And when the presentation reaches the last slide it will simply end—the presentation will not automatically loop back to the start and continue running. To make the presentation self-running click the TRANSITIONS tab on the main menu. On the far right of the TRANSITIONS sub-menu there is the Advance Slide section. For each page in your presentation uncheck On Mouse Click, check After and enter the number of seconds (or minutes) you want the particular slide to be displayed. If you want the same display time for all your slides click the Apply To All icon. In the example below the first page will be displayed for 15 seconds before moving to the next page in the presentation. By default, when a presentation reaches its last page PowerPoint will not automatically advance (loop back) to the starting page. PowerPoint will quit the presentation after displaying the last page the specified time. 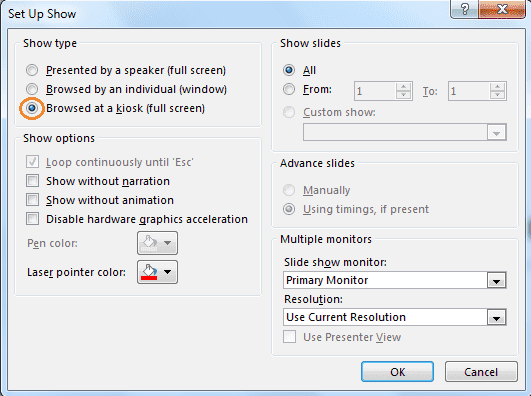 To continuously loop the presentation select kiosk mode. To setup kiosk mode select SLIDE SHOW tab from the PowerPoint main menu. From this sub-menu click the Set Up Slide Show icon. Select Browsed at a kiosk (full screen) option from the dialog box and click OK. After this is done your PowerPoint presentation will automatically run at full screen and loop continuously. After setting up kiosk mode your PowerPoint presentation is now ready to be used for digital signage display. That’s all you need to do to convert PowerPoint to digital signage. To properly display your presentation the PC running your presentation must have the correct fonts installed. Otherwise your presentation may not look as intended. To remedy this problem you can embed the fonts in the PowerPoint presentation file. 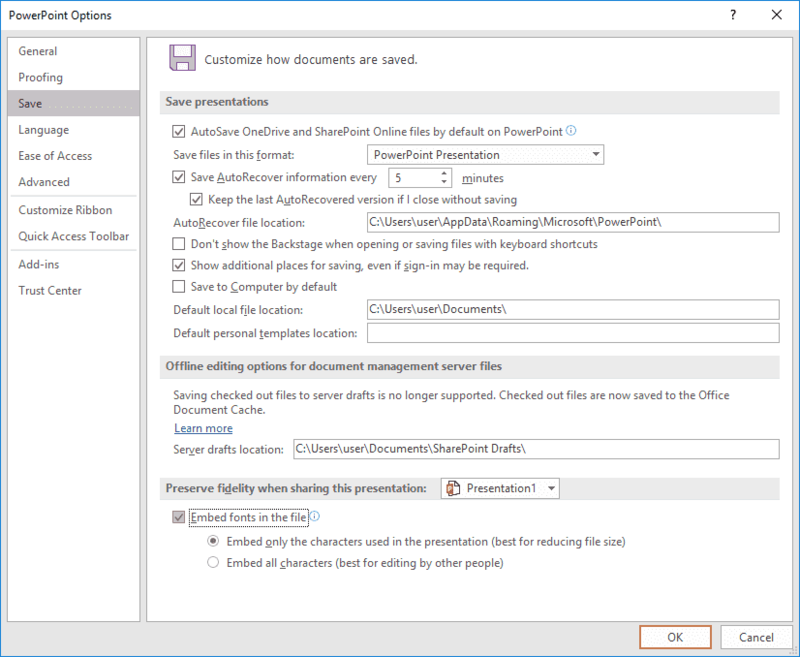 To embed fonts select File on the PowerPoint ribbon menu and then click Options. From the Options menu click the Save option. At the bottom of the Save menu check Embed fonts in the file and then click OK.
We have shown how to convert PowerPoint to digital signage. Now you must find a means to display your PowerPoint signage. If you have very simple needs use a second-hand Windows PC with a LCD screen to display your PowerPoint signage presentation. 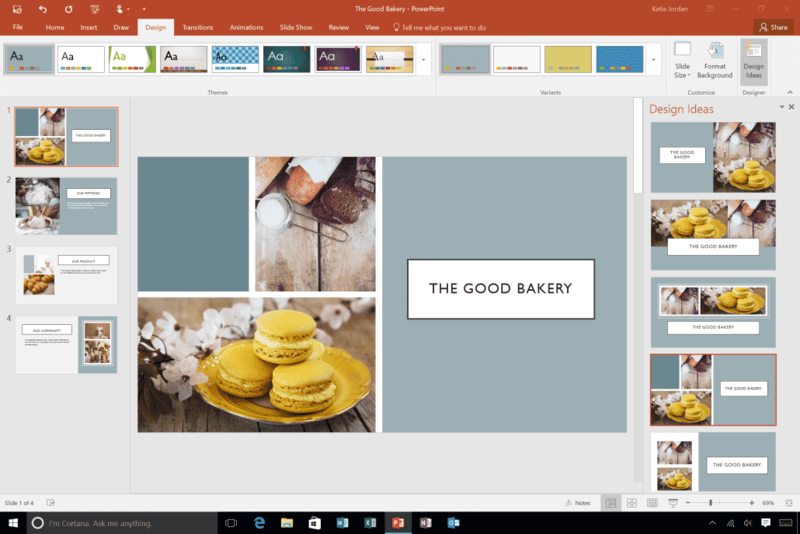 To save on software licensing cost use the free Microsoft PowerPoint Viewer program to display your signage presentations. You can even write a startup batch file that automatically runs the PowerPoint viewer and displays your converted PowerPoint signage presentation file on the LCD screen. Instead of using a big, bulky (and relatively costly) PC to display PowerPoint on TV you should take a look at PowerPlayer. PowerPlayer is a low-cost Windows 10 PC stick that plugs into your TV’s HDMI source input. It’s a pocket-sized digital signage player that displays PowerPoint presentations on any standard TV. PowerPlayer uses the free PowerPoint viewer so there’s no software license needed to display PowerPoint on TV. PowerPlayer is bundled with PowerSignage™, our cloud-based content management service (CMS). PowerSignage CMS makes it easy to upload, schedule and display PowerPoint on your TV screens. PowerPlayer automatically downloads your PowerPoint presentations and display them on your TV screen. All you need is Wifi Internet at the TV’s location. For more information on PowerSignage visit our website at www.powerdigitalsignage.com. Microsoft and PowerPoint are registered trademarks of Microsoft Corporation. PowerPlayer and PowerSignage are the trademarks of Power Media Design Pty Ltd.